Sophocles' Ajax describes the fall of a mighty warrior denied the honour which he believed was his due. This edition of the play presents a text and critical apparatus which take full advantage of advances in our understanding of Sophoclean manuscripts and scholarship. The introduction and commentary scrutinise all important aspects of the drama - from detailed analysis of style, language, and metre to consideration of wider issues such as ethics, rhetoric, and characterisation. Notorious dramaturgical problems, including the staging of Ajax's suicide, receive particular attention; so too do questions of literary history, such as the date of the play and Sophocles' creative interaction with previous accounts of the myth. The translation which accompanies the commentary ensures that this edition will be accessible to Hellenists of all levels of experience, as well as to readers with a general interest in the history of drama. Introduction; Text and critical apparatus; Commentary; Bibliography; Indices. P. J. Finglass teaches Greek and Latin at the University of Nottingham. 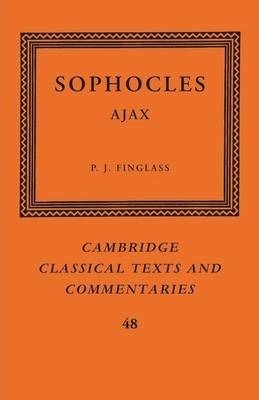 He has previously published editions of Sophocles' Electra and Pindar's Pythian Eleven in the Cambridge Classical Texts and Commentaries series. His research for this book was funded by an Early Career Fellowship awarded by the Arts and Humanities Research Council. His research for this book was funded by an Early Career Fellowship awarded by the Arts and Humanities Research Council.